Celebrate the launch of Gathering Storm. If, somehow, you've never played a Civ game, for the next couple of days you can try Civilization 6 for free on Steam. Maybe you've been holding out with Civ 5 until all the expansions launched (seriously, there are still thousands of you), or maybe you just haven't had the time. Either way, this is a good opportunity to pick up Firaxis's 2016 4X game and give it a go. The game is also discounted on Steam by 70 percent during that time. This, of course, coincides with the launch of Civ 6: Gathering Storm later this week. The latest expansion adds global warming as a factor once you reach the modern age, as well as a detailed world congress system that offers a different way to gain control throughout the game. Fraser liked the expansion to the tune of 81 percent. 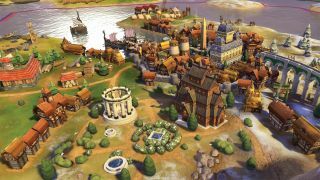 "Civilization 6: Gathering Storm bites off a lot, but it proves more than capable of juggling big concepts like climate change and global diplomacy. It turns them into coherent but still complex systems that you'll constantly be interacting with, even before you start noticing that the beaches are vanishing." Gathering Storm launches on February 14th.